On that day the first version of a Virtual Time Travel project will be released. 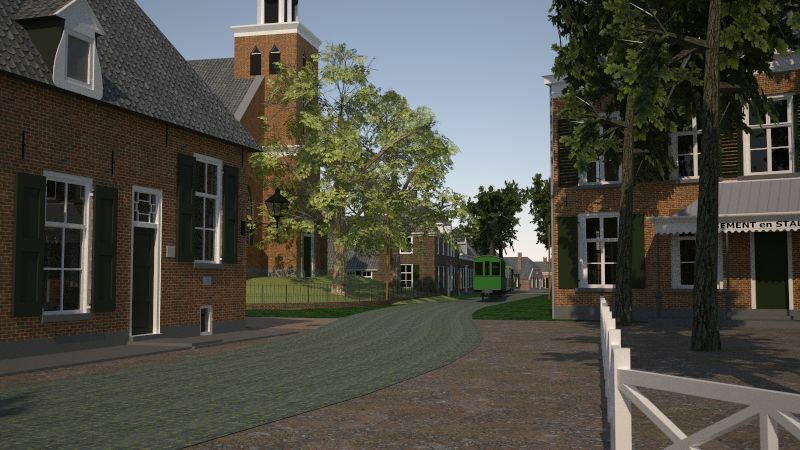 The project ‘Hummelo 1900’ will enable travelling to the past of the small Dutch Village of Hummelo in the year 1900. In the past year we have released a number of previews of the Hummelo 1900 project. These already gave an impression of what could be expected. The last months have been used to complete the environment with all the buildings in the neighbourhood of that time. Important objects line the electricity poles and the water pump have been installed. Finally, the stream tram engine has been improved greatly to mimic the real behaviour in that time. The quality of the environment has been improved using the best possible techniques in order to achieve a realistic reproduction of the past. As much details as possible are included and textures and shadows give the environment a realistic feel. A visitor of Hummelo 1900 will feel as if he is actually walking around in the village. He will be able to visit specific buildings like the church and a number of houses. The windmill can be visited, Climbing the stairs of the floor levels will reveal the mechanism and show the milling stoned driven by the wicks of the windmill. Additionally one can enter the carriage of the steam tram which will take you to the castle ‘Enghuizen’. The goal of the Virtual Time Travel projects is to reproduce past environment digitally as realistically as possible. Using state of the art techniques from gaming and virtual reality the visitor will have a high degree of presence in the historic environment. Time travel to the past will virtually be possible.